Almonds, Pumpkin Seeds, Brown Rice Syrup, Dark Chocolate Coating (Sugar, Chocolate, Cocoa Butter, Soy Lecithin, Vanilla), Soy Crisps (Soy Protein Isolate, Tapioca Starch, Salt), Sunflower Seeds, Chicory Fiber, Cane Syrup Cyrstals, Peanuts, Sea Salt, Natural Flavors. Almonds, Pumpkin Seeds, Brown Rice Syrup, Dark Chocolate Coating (Sugar, Chocolate, Cocoa Butter, Soy Lecithin, Vanilla), Soy Crisps (Soy Protein Isolate, Tapioca Starch, Salt), Sunflower Seeds, Chicory Fiber, Cane Syrup Cyrstals, Peanuts, Natural Flavors, Sea Salt. I know how hard it is to eat well when you're always on the go. 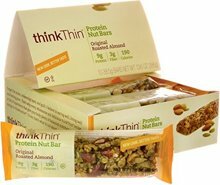 That's why I created thinkThin Protein Nut Bars, loaded with 9g of hunger-fighting protein and 3g of fiber, all for 190 calories. Each White Chocolate bar is chock-full of nutritious whole nuts and pumpkin seeds, drizzled in sumptuous white chocolate. It's a perfect way to fuel up and fight cravings anytime, anywhere. Contains: Tree Nuts (Almond), Milk, Peanut, Soy. Almonds, Pumpkin Seeds, Brown Rice Syrup, Organic White Chocolate Coating (Organic Cane Sugar, Organic Cocoa Butter, Organic Milk Powder, Soy Lecithin (Emulsifier), Organic Vanilla Extract), Soy Crisps (Soy Protein Isolate, Tapioca Starch, salt), Sunflower Seeds, Chicory Fiber, Cane Syrup Crystals, Peanuts, Sea Salt, Natural flavors.